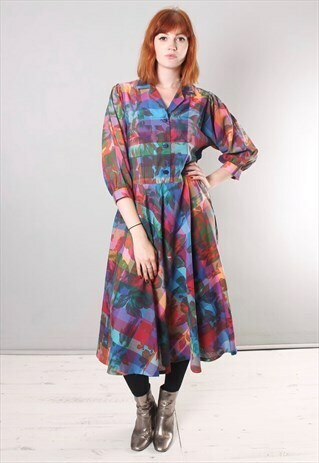 This Salvaged garment is a 100% vintage 1970s floral & multi-coloured check patterned midi length dress with 3/4 length puff sleeves, open collar V neck and fabric buttons down top with flared skirt and elasticated waistband. Cowgirl western style shirt dress. CONDITION - Excellent vintage condition, may be some natural signs of wear due to age. SIZE - Model is a size 8 and 5'7". Garment size 10-12. Pit to pit 18" 46cm / Waist 32" 81cm / Length 46" 117cm / Pit to cuff 13" 33cm. DELIVERY - Next day delivery available Monday-Thursday on order made before 1pm. Orders made on Friday will be posted on Monday. Model is a size 8 and 5'7". Garment size 10-12. Pit to pit 18" 46cm / Waist 32" 81cm / Length 46" 117cm / Pit to cuff 13" 33cm.